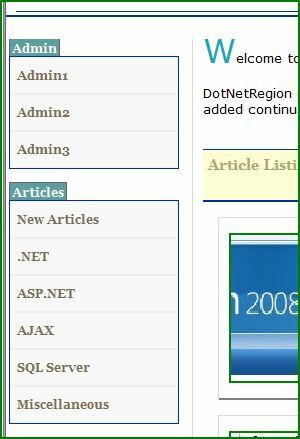 This article shows different ways of adding/showing individual menu items to a menu. Also looks at separating menus by the role of the user. Have a set of menus that are to be shown according to the context or the user; for example, show the admin menu if the person currently logged on is an administrator. Similarly you may want to add individual menu ITEMS according to the context or role of the user; for example, just as above, show the admin-related menu items in a given menu if the person currently logged on is an administrator. In Listing 1, stripped-down version of a common menu is shown. As the declarative syntax shows, the whole menu object is held in the asp:Menu tags. Under the Items collection, the individual MenuItem declarations are stored. Once you have drag-dropped the menu from the toolbox (or declaratively added a menu with the appropriate attributes and child elements in the .aspx source file), you will have an object of class Menu available to you from the code window (.cs or .vb). Menu is new class in .Net Framework 2.0 and as you can expect comes with a lot of properties and methods. Now let’s get back to our scenarios. If you want different menus shown in different contexts, first create those different menus: perhaps one menu contains a set of menu items that are to be shown all the time. And another menu contains only admin-related items and are to be shown only when an administrator has logged in. Sometimes you want to show/hide a whole bunch of things in addition to the appropriate menu. In this case, you can put all of them inside a panel and then show/hide that panel according to the user. The second scenario is to add additional menu items if the administrator has logged in. Here, we are creating new MenuItem objects dynamically and using Items.Add on the menu of our choice, we are adding the menu items. The following figure shows an example of two separate menus shown when an administrator logged into the system. Only the bottom one will be shown by default.